Before shopping on Amazon, please click the image to the left. Amazon donates a portion of your purchase to Mapleton Elementary at no extra cost to you. Thanks for your support! DISCLAIMER: Any and all items bought through this link cannot be resold or used for commercial use. Mapleton Elementary celebrates their favorite SUPERHEROES April 30th-May 4th! 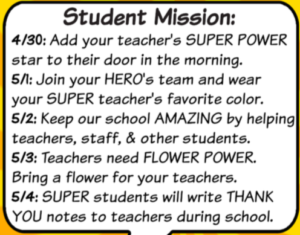 Click the link below for a copy of the Teacher & Staff Appreciation Flyer and to print out a star for your student to put on their teacher’s door. Mapleton Elementary at no extra cost to you. Any and all items bought through this link cannot be resold or used for commercial use.